An Array of Sunshine thoughts. I'm a member of a group that provides support to families when they go through the loss of a loved baby lost to miscarriage and today I received a request to make some cards for a family who have suffered another shocking loss. They know that their little angel was a girl so I needed a card that was quick to pull together as I needed to get it over to the hospital this afternoon. I﻿ used the new Array of Sunshine set which is a new Hostess set available tomorrow when the new Idea Book & Catalogue launches. The base cardstock is Pink Pirourette. I stamped using my stamp-a-ma-jig the dots from a retired Polka Dots set as the area wasn't quite filled with one stamping, then added the large flower which I had stamped onto Whisper White cardstock and cut out, stamping the centre twice so that I could do a fussy cut giving the 3D look. Using the scalloped border punch I added a little more at the bottom and finished it off with some white grosgrain. The sentiment is from the Teeny Tiny Tags (IB&C p 105). Tools & Embellishments: Paper cutter, bone folder, snail adhesive, dimensionals, paper snips, clear block D, .border punch, 1/4" white grosgrain ribbon, stamp-a-ma-jig. Christmas Card for our Aussie Troops. Who will you be spending Christmas with this year? I know I've very pleased that I will be lucky enough to spend it with my family, but being a part of a service family I do know that there will be families who have members serving in our Armed Forces who won't be able to do this. It's only a small thing but each and every year Stampin Up are involved in helping send loved ones wishes over the Christmas period through homemade Christmas cards which are made by avid crafters in their own time. The way it works is people either individually or as working parties make as many homemade Christmas cards as they are able to, and pass them onto a representative who is then able to hand them to a base - in my case RAAF Williamtown, and the cards are then transported to our serving members. They are distributed to these members who then send them back to their families in Australia, giving them a little something to make Christmas the special time it is. So I guess my plea to all my crafting network is PLEASE make some cards as I can assure you living amongst a large serving member community that these cards will hold a very special place in the lives of those who are here in Australia without their husbands or wives. On Wednesday 26th October a group of people lead by Tracey will hold the yearly working bee hoping to add to the card numbers which need to reach 4000 in order to meet the number of serving members. To date we have around 500. This event will be held on RAAF Williamtown base so if you are free on this date please email me for more details. We all do understand that due to this being a day event a number of either Mums with little ones or working can't attend so I am holding three separate nights at my home where you can pop in to make some cards with me. The cards need to be completed by the 27th October, so if you are able to help make some please email me for my address as they will need to be posted to me well before this date. There are no rules about the cards made, except that they need to be handmade and include envelopes. When you send them to me would you please place them into a glad seal type bag labelled with the number of cards in the bags. You don't have to use only SU products, that's not what this is about. If you would like to pop your own insigna on your cards which includes as address or email that's fine as well as quite often the recipients like to thank the people who made the cards. A Little Treat - JAI 82 - Just add something from your STASH! 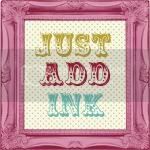 I so loved this weeks challenge by the Just Add Ink team. The challenge was to rummage through all those items we crafters buy with the thought of using and then pop them onto the work table where they get lost, or at the bottom of the craft cupboard only to wonder where they are. I went through my somewhat vast collection of stamp sets to see what I would like to create with and came across the A Little Treat clear mount set which is an amazing $15.95 (IB&C p43 ) seeing that I'd obviously not go a lot of use out of this set as I hadn't even mounted it! I was also inspired by a new customer who just purchased this set from me - so thanks Jo! It was a super fun card to make though looking at it now I would add a little secret compartment to the back of where the smarties are as the only way to get these out from this card will be to tear the front off! I've since made another couple with little pull out sections which I'll post the instructions for soon. The trick to these cards which use the treat cups (IB&C p126) really is in the coordinating punches. I tried to make my first few without it and it took me ages to line them all up. I didn't have the large circle punch as I've not needed it for anything else as yet - but I OWN it now. I made making these cards so much easier and faster. The dsp I used is a retiring one - Celebrations - which I am very sad about as I have made some amazing cards and scrap layouts with it as it's so bright and cheery. Lucky for me I did buy a few spare sets to stash away for later use. You still have 24 hours to grab yours before the current Idea Book & Catalogue ends so email me if you need to grab some too. The stamped Happy Birthday sentiment is from the Party This Way clear mount set (IB&C p39) and I used the window and modern label punches (IB&C p150) to finish it all off. The light blue rhinestones which match the Bashful Blue ink are Kaisercraft. Let me know what you think by leaving me a comment! Tools & Embellishments: Paper cutter, bone folder, snail adhesive, dimensionals, paper snips, clear block D, .1-3/4" circle punch, window punch, modern label punch, 1/4" white grosgrain ribbon, paper piercing kit, treat cups and of course SMARTIES. Over at Just Add Ink the challenge this week was a colour one. Bron has provided us with this interesting colour combo! These are definitely not colours that I would ever have thought of using in a combination but I am so thrilled with how my card turned out. I decided to get a start on Father's Day cards as it's just around the corner and Ive had a couple people ask me to make them one. The stamp I used is called Sail Away and it was an al a carte from the last mini. I believe it is not available now but the Seaworthy set (IB&C p79) has a nautical theme very similar. There is also a new male oriented set available in the new 2011-2012 Idea Book & Catalogue which is now available to purchase. The card base is embossed with the Square Lattice folder (IB&C p157), then I simply added three strips of cardstock in the cajun, peach and blue. 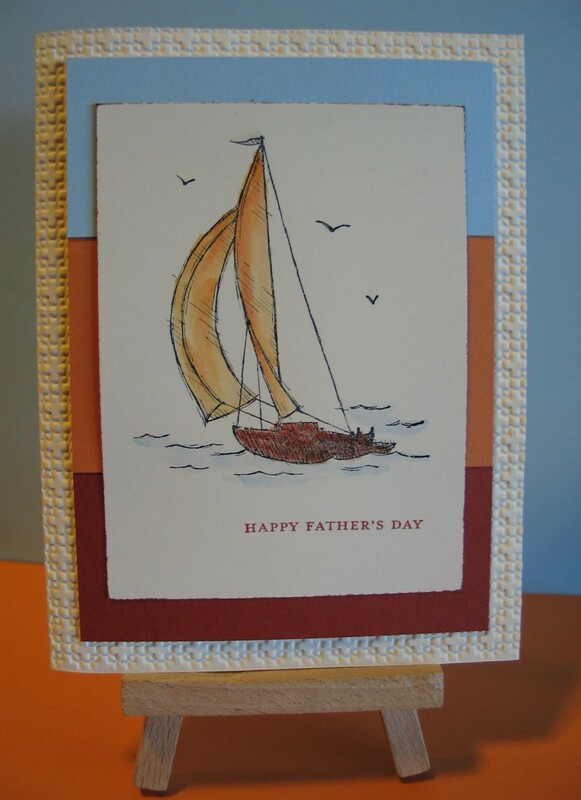 The image was stamped onto Very Vanilla and I used an Aqua Painter (IB&C p147) to water colour the sailing ship. 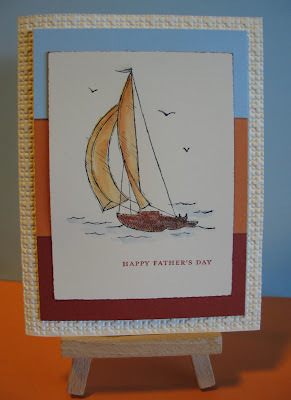 The Happy Father's Day sentiment is from my favourite Teeny Tiny Tag set (IB&C p105). Once I had the ideas tucked away it was a really quick and simple card. Inks: Basic Black, Cajun Craze, Peach Parfait, Bashful Blue. Tools & Embellishments: Paper cutter, bone folder, adhesive, paper snips, Sizzix Big Shot Machine, square lattice embossing folder, clear block D, aqua painter. This month as a part of our demonstrator team we are all making swaps using new products that will be available in the new Idea Book & Catalogue. The lucky thing as a demonstrator is that we get to have a sneak peak of the IB&C before everyone else and we are even able to purchase a few stamp sets as well. I love our swap times as I am always amazed at the cards I get back and the effect that so many go to. I'll try to remember to take some photos of the next lot I get back to share with everyone. Due to policy I'm not able to take a photo of the whole stamp set but I can tell you it's a new Hostess Set called 'Array of Sunshine' and it comes in both wood and clear mount. I've now seen a number of cards made using it and am amazed at how beautiful they all are. It was a fun card to make and was easy except for all the time it took me to fussy cut the flowers and leaves out. I also tried out some of the new In Colours, which I was pleasantly surprised with as I wanted to make sure I could match them up with the regular colour collections. I'm happier than I thought I would be with the colour combination. The stamped sentiment is from the Teeny Tiny Tag set (IB&C p105). This contains 24 individual stamps which cover so many occasions, and has been getting a far work out from me lately. When I do get customers asking me to recommend a sentiment set this is the one I always choose as it's able to cover many events and is so reasonably priced. It is nearly time for the new Idea Book & Catalogue to launch so don't miss out if you haven't already pre-ordered one from me you can do so by sending me an email. Here's one more card which is of the same style but I added a little bling with some rhinestones and a couple more leaves. Inks: Wisteria Wonder, Calypso Coral, Lucky Limeade. It's arrived and how exciting! The new 2011-2012 Idea Book & Catalogue. It was like an early early birthday present arrived this morning! I finally received my copies of the new 2011-2012 Idea Book & Catalogue. Even the cover on this is inspiring. As well as these I got some new release stamp sets, new In Colour ink pads and card stock, new punches and some other embellishments. The stamp sets - two or which are from the new Hostess range - are just beautiful and I can see myself using them on so many projects, especially for Christmas. Although I was very disappointed that Pun Fun was a retiring set, now that I've got it's replacement I can see it won't be so bad. I'll hopefully be able to make some goodies this weekend so I can show you the sets I have next week. Make sure to stop back and have a look. The a la carte range of single stamps has increased which I know will please a number of my customers who prefer to buy singles rather than sets all the time. There are an array of amazing new In Colours which have the most amazing co-ordinating ribbons that will sell like hot cakes. I'm pleasantly impressed with the variation of the stamp sets in this release and know that I'll have so many more stamp sets over the next 12 months that I will be running out of storage space far too quickly. Finally there are some new and amazing sets for children and those of the male variety. There are only 12 days left until I can show you the Catalogue. If you would like to receive one of your very own please email me and I will organize to have one posted put to you. Crikey he's 5 already - Happy Birthay. It's hard to believe but Noah's favourite friend in the world, and our old neighbour - Michael - turned 5. Where on earth has all that time gone, we remember vividly the 3rd birthday party which I might add only seemed months ago. We hadn't been back to Canberra since our move in January, and although we've seen our friends a few times since then, I really needed to go back for a visit. What better reason that a birthday party. This years theme was Bindi - the jungle girl, but I couldn't find inspiration in that so I went with one of the cutest stamp sets the Make A Monster (IB&C p 62). There is so much scope for the imagination. The monsters are all stamped using the basic black ink as it is waterproof and doesn't smudge or bleed once it's dry. I then used the aqua painter brush and ink pads to colour in the monsters. A couple of brads were added to the card to give it a little something extra. Inks: Bashful Blue, Old Olive, Pumpkin Patch, Basic Black. Cardstock and Paper: Whisper White, Bashful Blue, cardstock I can't remember the name of! Noah's made a very best friend at school this year - Grace, who he just adores and having watched them at school and in social events I believe it's a reciprocal thing! Grace attends the same preschool as Noah and just recently turned 4. She had a lovely little party with only 5 other friends - we loved the laid back affair - and of course our boy was the only male representation there. He's a ladies man I am sure. I asked Noah to find out from Grace what she'd like as a present and he came home saying - "Grace loves all things Princess and Fairy Mum". So the choice of stamp set was an easy one. This stamp set is called A Little Bit of Magic and I am not sure it was ever released in Australia. I do have a knack for that - falling for stamp sets not available to my customers! I would happily stamp out some images for anyone who'd like some for the small cost of the cardstock and postage. I choose to use the In Colour range of making this card as I haven't used it much even though it's now been around for 12 months. I used the Blushing Bride as the actual card base then layered it with Concord Crush cardstock, Blushing Bride dsp and more Concord cardstock. The fairy is stamped onto Whisper White using the Basic Black Ink - again as this does not bleed when water coloured. I used the Aqua Painter (IB&C p 143) and Blushing Bride, Poppy Parade, Cake Crumb, Garden Green, Concord Crush and Daffodil Delight Ink pads to water colour the image. I was so happy with how it turned out. I used a little Dazzling Diamond (IB&C p 141) on the fairy wings for a shimmer effect. The brads I used are not SU - but are available from me, and the ribbon is the 1/2" stitched-poly ribbon in Concord Crush (IB&C p 136). I finally conquered the no tie bow as well on this card which I was thrilled about. To add a little more interest on the inside of the card I added the smaller fairy which I stamped and fussy cut. She was also water coloured in the same theme colours. After making this card I have definitely decided I need to make better use of the current In Colour range, especially as next month there's 5 more coming! Inks: Blushing Bride, Poppy Parade, Cake Crumb, Garden Green, Concord Crush, Daffodil Delight, Basic Black. Tools & Embellishments: Paper cutter, bone folder, adhesive, paper snips, clear block D, brads (available from me), poly-stitched ribbon in Concord Crush and Dazzling Diamonds. Say Goodbye! There's only 14 days to go. It's time to say goodbye! Every year Stampin Up retires hundreds of products and now is the time for you to grab these last chance items before they're gone. The great thing about the retired list is that you can grab some of the retired items on sale. But you need to remember that there are limited stocks so once they're gone, they're gone! The sale ends on the 31st August, yes only 14 days to go. To make sure though that you don't miss out which out the pdf here and then email me as quickly as you can. We were so excited to hear the news that our wonderful friends from Canberra had their third addition to their family. We've a special bond with this family as Liz and I were colleagues who were pregnant at the same, saw the same OB and had our beautiful children two days apart at the same hospital! The beautiful Anneliese arrived just over a fortnight ago and we were lucky enough to be able to meet her when we went for a fleeting visit to Canberra last weekend. She's the third beautiful girl to grace the family and we're so thrilled for the whole family. She looks just like her Mummy with a gorgeous head of red hair! I had to think about the cards I'd made for the two older sisters as I didn't want to make one the same or even similar. I then remembered the SU set Big on Spring, which has been retired for some time now but is one of my favourites. It's a play with words sort of stamp. I used SU cardstock for my card base, and the stamped image and it's matting as well as markers for the colouring of the words but the other prodcuts are no SU. I'm really happy at how it turned out and was so thrilled that Liz loved it too. Inks: Certainly Celery, Apricot Appeal, Pretty in Pink. Tools & Embellishments: Paper cutter, bone folder, adhesive, paper snips, clear block F, button brads (available from me), Kaisercraft rhinestones, paper flower, ribbon. WOW! I have been away from my blog for near 2 months now and there are so many reasosn why - with the most wonderful being that our family will increase by one in January 2012. This is such as special time for us as we sadly lost a little person in utero last year and then had 2 further miscarriages to boot. I've been sicker than I remember being with Noah (who's 4.6 now), and so just haven't had the energy to be blogging. This doesn't mean I haven't been creating and making, as I certainly have been so I promise there will be photos soon. I've been hitting the scrap page world more so over the past little while, as I am so desperately trying to complete all the pages I wanted to do of Noah before I begin on the scrap journey with our bub three.